Hermann Bleuler's father Johann Caspar (1801 - 1882) was a merchant and silk manufacturer; he was also a member of Zürich's cantonal parliament for some years. Hermann's mother Sophie Regula née Arter (1811 - 1880) came from a family of merchants. Hermann, the second oldest child of the family, had two sisters and three brothers, one of whom became a doctor; the other two became planters in Guatemala. At the age of eight he entered the boarding school for boys "zum Felsenhof" in Männedorf (canton Zürich). This international school 'replaced the then missing secondary school' . Afterwards Bleuler attended the Gymnasium and then the Industrieschule in Zürich. He was one of the first students at the Polytechnic: He matriculated at the Engineering Department in 1855, the school's first year. After his graduation in 1858, as one of the Polytechnic's first eight civil engineers, he worked as an engineer for two years, at the machine factory Bell & Co in Kriens (canton Luzern). Bleuler had a stellar career in the Swiss army, in which he enrolled in 1861. A year later he became head of the Federal Artillery Bureau in Aarau and secretary of the Federal Artillery Committee. He was promoted to captain in 1864, to major in 1868, to lieutenant colonel in 1869 and to colonel in 1871. In 1870 he was appointed to chief instructor of the artillery, a position that he held for eighteen years. As such he helped to improve the standard and training of the artillery. He also invented a 'ground-breaking'  field howitzer. In 1883 he became commanding officer of the 6th division, and in 1891 he took command of the 3rd corps. In addition, he became a member of the National Defence Committee. Bleuler became a member of the Federal School Board in 1881, the year when the Polytechnic's regulations were revised. As a result, the age at entry for students was raised, students had a greater freedom to choose their courses in their last two years, the standard of technical education was raised, and the teaching staff were allowed to elect the school's Director -- the first one being Geiser. Moreover, the School Board now consisted of seven members instead of five, of whom some came from industry . Alfred Escher (1819-1882) was a Swiss politician and railways pioneer whose influence on Swiss politics and economy in the 19th century remained unequalled. Escher was instrumental in founding the Polytechnic and served as Vice-President of the School Board from 1854-1882. Bleuler became Vice-President after Alfred Escher's death in 1882, and in 1888 he succeeded Karl Kappeler as president of the School Board. Both the President and Vice-President used to be appointed for life, but Bleuler retired in 1905 due to health reasons. Incidentally, he was a good friend of Geiser. He helped to improve the Polytechnic's reputation by supporting the construction of engineering laboratories and appointing excellent teaching staff. Following Kappeler's method, Bleuler often attended lectures of teaching candidates incognito to assess their qualities. On the whole, the Polytechnic continued to boom during his presidency, particularly economically. However, when the Polytechnic professors demanded the right to award doctorates, more freedom in their research and greater freedom of choice for their students at the beginning of the 20th century, Bleuler used his position and connections to the government to thwart these reform attempts . In addition to his positions in the army and at the Polytechnic, he also served as president of the Polytechnic's alumni association, the Gesellschaft Ehemaliger Polytechniker (GEP), from 1885-1888. In 1873, Bleuler married Emma Huber whose father had also been a silk manufacturer. The couple had a son, Walter (born 1875). In 1887, the family moved into the so-called "Villa Bleuler", which was built for them. Today the building houses the Swiss Institute of Cultural Studies . In the afternoon [Tuesday, 10 August] the ladies were invited by Mrs School Board President Bleuler. 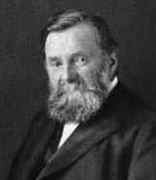 Hermann Bleuler died on 7 February 1912 after a long illness.